A week ago my mom sent me an awesome salad recipe. It sounded so good I had to make it right away! I made it for lunch and Hubby and I shared it. We were quite full afterward, so it is perfect for a full lunch, but you could also use this as a side for dinner. Below I've posted my mom's e-mail for you to follow and I've added pictures from when I made the salad. She even gives an easy way to separate the pomegranate seeds! Bon appétit! After mixing these two ingredients in our salad bowls I add a little salad dressing because I prefer the dressing mainly on the greens. I use orange poppy seed dressing. Optional - can also add grapefruit slices with the skin removed from the slices (supremed). 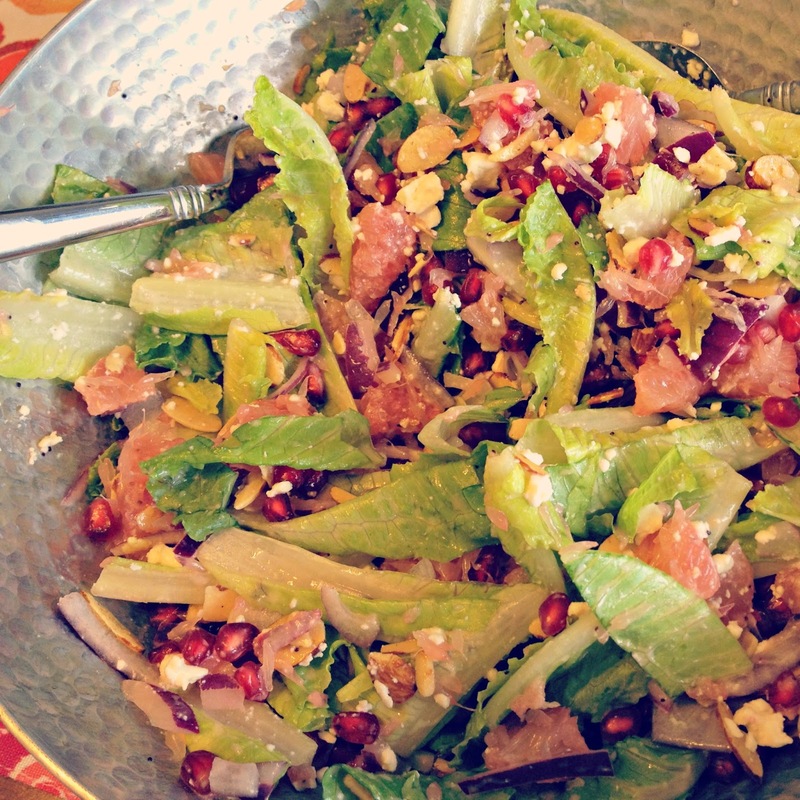 Anyway, I think it is a pretty salad because of the red pomegranate seeds. For the pomegranate pick one that is heavy as that should indicate it is juicer. Score the skin with a knife down to the seeds all the way around the equator. Break it in half on the score line by just pulling it apart. Gently stretch the outer skin by giving it a little pull, rotate, repeat to loosen the seeds from the shell. Hold half of it over a big bowl with the seed side facing your palm, skin side up. Spank the pomegranate all over with your big spoon! The seeds should just pop out! The pomegranates I've gotten have been fairly large so there were a lot of seeds for a number of salads. The seeds are also good in yogurt, and just by themselves. I'm still eating pomegranate from my batch on thanksgiving so you are right so much seeds I put in a mason jar to add to my salad this salad looks amazing great idea to add grapefruit. Yummmm! This looks so darn good! I would make this without the pomegranate well, I don't have any in the house. LOL! [ Smiles ] It is nice to see that you are having fun with your salad and eating it too. The truth is: people would be way healthier if they ate more salads. it looks like a pretty and delicious salad. i love salads. they're so good. love your table set up lauren.